You know that area right underneath your nostrils? Mine is red and dry because I have been blowing my nose for almost a week now. Yuck. Colds are the worst. I still have energy to go about my usual business, but I’m just a snotty, gross mess. 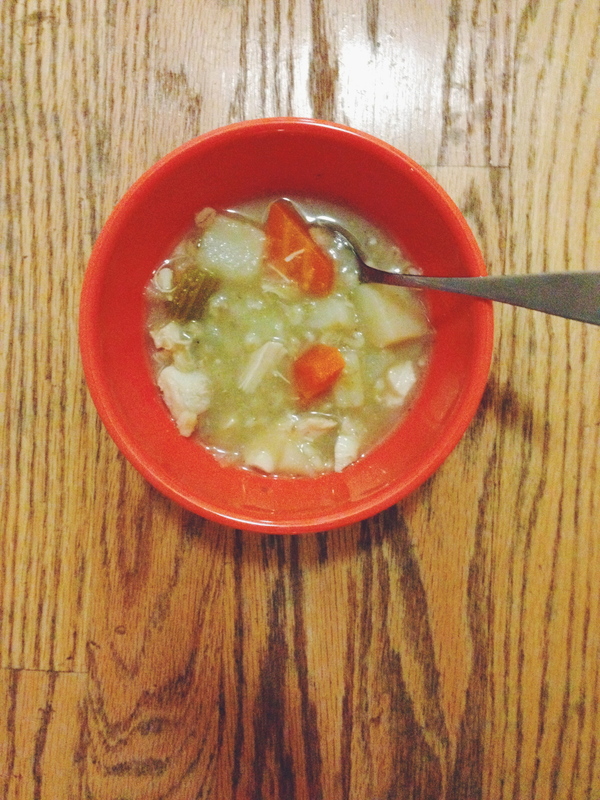 Funny enough, a few days into the snotty sickness that has been permeating my apartment, I received an email from my boyfriend’s mom with a recipe for a fantastic chicken barley soup. Must have been mother’s intuition that we needed comfort. 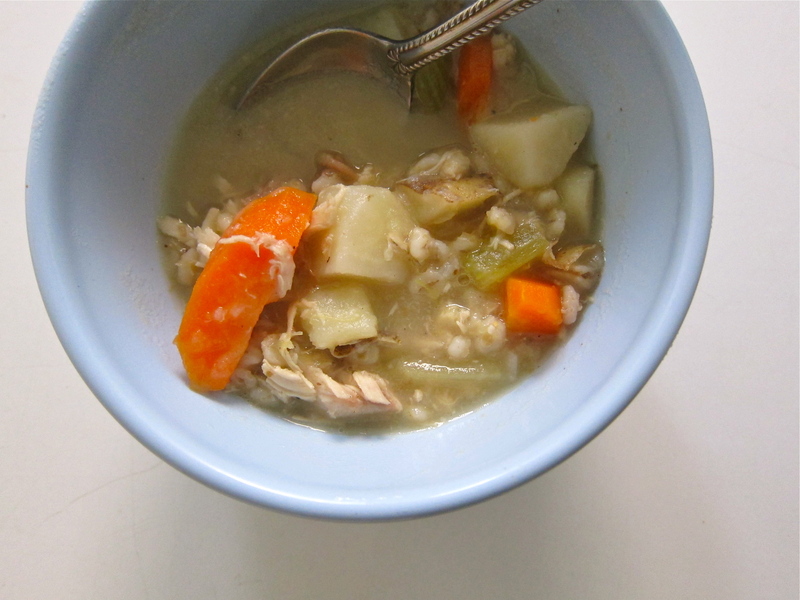 This “Creamy” Chicken Barley Soup is heartier than the typical clear-broth chicken soup. Blending some of the broth with cooked potato, onion, celery, and garlic lends a creamy texture without any cream. If your favorite kitchen tool is an immersion blender, raise your hand! Makes life so easy. Adding a little barley to the soup offers a nice contrast, a bite of texture. Barley is a great source of whole grain, it is rich in fiber and protein, and it turns the soup into its own meal. I used a homemade turkey stock for this soup. It is so easy to freeze a bunch of leftover odds and ends of vegetables and prepare a quick stock. After I made a vegetable stock, I strained it, and then added it back to a pot with the neck and giblets I had in the freezer from my Thanksgiving turkey. There’s some good dark meat on the neck of a turkey, so don’t throw the neck away! Prepare your stock the day before if you want to get ahead. So I had turkey stock in my chicken soup. No big deal. If you are short on time, you could just use water instead of stock, and add salt. Or buy stock. Either way. Note that you could buy pre-cooked chicken, but I found it very easy to just toss two breasts (save the bones for stock if you want!) in the oven while I was preparing the rest of my ingredients. First, cook your chicken breasts. Preheat the oven to 350 degrees F. Place the chicken breasts skin side up on a parchment-lined sheet pan. Rub with olive oil, sprinkle with salt and pepper, and roast for 35 to 40 minutes, until done (165 degrees F). When the chicken is cool enough to handle, discard the skin and bones (save the bones in your freezer for stock), and shred the meat. Cover and set aside. Meanwhile, in a large stockpot melt butter (or oil) and saute onions, celery, garlic until soft. Next, add potatoes, 6 – 7 C chicken stock, and thyme. Cook until potatoes are soft (15- 30 min), then use an immersion blender or transfer 3/4 of the mixture to a blender and blend until smooth. Return this mixture to the pot, add the carrots, barley and bay leaves. Cook partially covered for 30 minutes. Add more stock for a soupier soup. When barley is tender, add wine and chicken, salt and pepper to taste. Cook for a few more minutes to warm up the chicken.